Thousands of people across the country took to the streets on Saturday for the Families Belong Together rally against President Donald Trump’s immigration policy. Protesters gathered to call for an end to family separation, and the speedy reunion of parents and children. 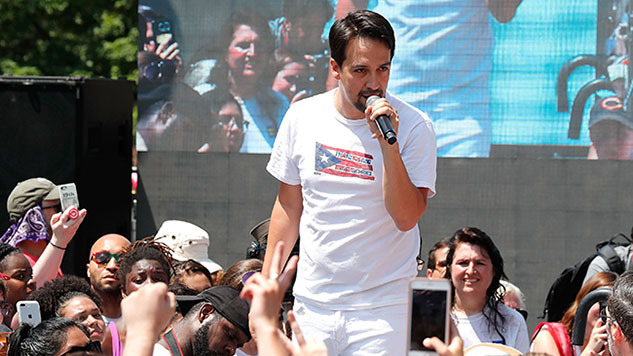 Lin-Manuel Miranda was one of these thousands of protesters and he dedicated a lullaby to the migrant parents who had been separated from their children, delivering an a cappella rendition of Hamilton’s “Dear Theodosia” in Lafayette Square, right across the street from the White House. The Hamilton creator wasn’t the only high-profile celebrity present. Singer Alicia Keys read a letter from a mother whose child is being held in one of the detention facilities near the border and reflected on what it would be like to be separated from her son Egypt.